No part of your home is off limits with a stair lift. They are easier to install and more affordable than ever. We can provide easy accessibility to your whole house by installing a stair lift on straight, curved or even outdoor staircases. 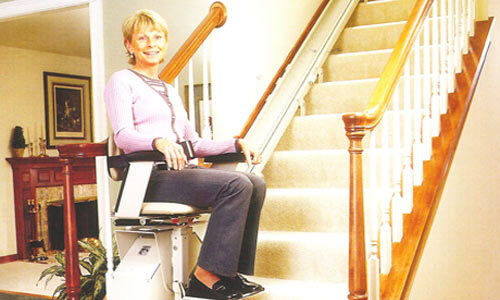 Bruno’s Electra-Ride II straight rail stairlift combines powerful and quiet operation with reliability and safety. Don’t compromise your independence! Rediscover the home you love with this efficient and attractive stair chair lift. * Battery operation makes installation a breeze – no need to install additional electrical outlets! The Electra-Ride II chair lift makes going up and down stairs a pleasure. Your quality of life should include your entire home, and with this Bruno chair lift it does! 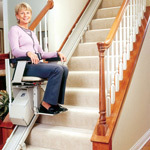 An Exceptional Value, the Electra-Ride II may be the perfect stair chair lift to revitalize your home… and your life. With superior styling and superb craftsmanship, the Electra-Ride Elite (Model SRE-2010) offers the finest in streamlined, ultra-compact design and performance. A home chair lift that reflects the taste and sophistication of the most elegant homes, the Elite sets the new standard for residential accessibility. Make your beautiful house a home, once again. The newly redesigned Electra-Ride Elite combines marvelous elegance with the industry’s most reliable operation. There are many stair chairs, but the Elite stands alone! Complement your home and your lifestyle with the finest in home chair lifts.